Tailored for life scientists with little or no prior programming experience, this course, organized by ENPICOM, is driven by real-life use cases. Participants will learn by doing, completing snippets of code that they will be able to reuse in their everyday tasks. Extensive use of IPython Notebook (Jupyter) will encourage to annotate and document the code, building the basis for sound and reproducible data analysis. All life scientists with no or little programming experience, but who are interested in learning python to automatize their everyday workflow. If you do have some programming experience, this course is still useful if you want to learn the basics of python and some useful python tricks. The course will run on November 10-11, 2016 in Amsterdam. 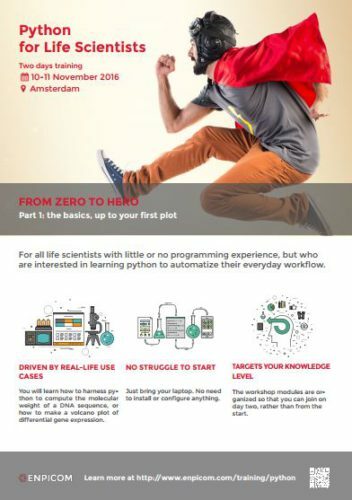 BioSB and ENPICOM are starting a collaboration in training and we are happy to announce that there is an opportunity for BioSB members to participate in the ENPICOM course ‘Python for Life Scientists’ with a significant reduction on the course fee of 100 euro (regular course fee is 545 euro incl. VAT). For more info contact Celia van Gelder at BioSB or directly ENPICOM’s training team at training@enpicom.com.